The French have withdrawn from the provincial capital of Santerem without a fight. 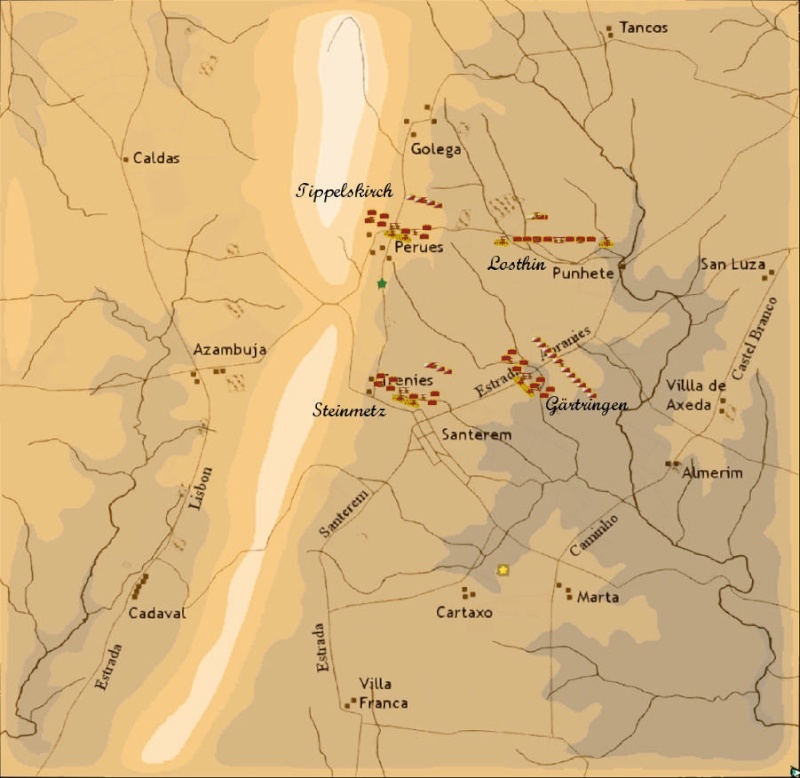 Cavalry patrols report an enemy force of what appears to be 2 divisions has taken position near the towns of Marta and Cartaxo. By doing so, they cover their lines of communication which run south through Villa Franca. The Prussian goal is to capture the towns of Marta and Cartaxo while destroying as much of the French force as possible. Extra credit is given for also capturing Villa Franca. Oberst von der Marwitz (2047 Cav. 11 squadrons Avg.Exp. 4. So the strategy is clear. The landwehr soak up the bullets while the regulars deal out the punishment. We will expect a stirring speech from the CinC today. Went the day well, gentlemen? Yes, I think we can award a victory to the Prussians. Both Steve and Pepe casualties. Steve was shot out of the saddle by a voltigeur. Pepe's ADC reports that our CinC was observed with bottle in hand for most of the battle. Finally gravity took a hand and our great leader fell to the ground senseless. A most disagreeable state of affairs. 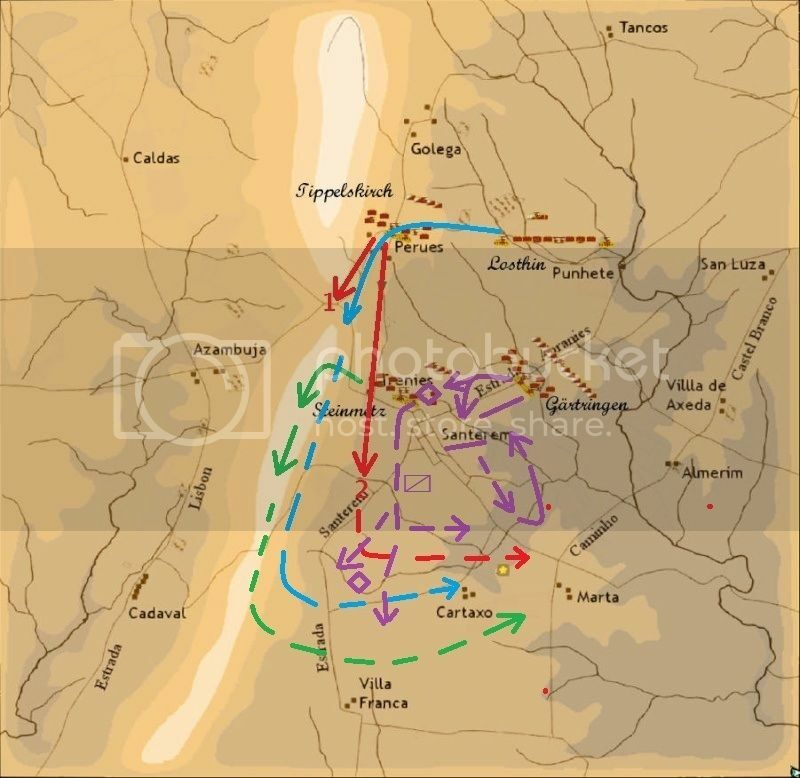 We had just captured Cartaxo and he was no longer available to lead his men east to Marta. Instead they emulated their fallen leader and proceeded to drink up everything in sight. By the time Pepe's ADC sorted things out, the men were of no use. A report has been made to Berlin. Ron managed to have his entire division wiped out. French heavy cavalry made short work of his command. Unfortunately, Ron did not stand with his men and share in their fate. Instead, he cravenly rode off to escape. A quick meeting of the surviving divisional commanders took place after the battle. A pockmarked wall now has a few more pockmarks. The corps is in need of a new divisional commander, but we also need a new division. BTW, I'm working on a scenario design for next Sunday. Should introduce a new wrinkle or two -- including giving Kevin a chance to try his hand at CinC. You'll want to bring your cast-iron knickers for this one..
From the Corps perspective the plan was perfectly put into practice from paper to execution, except that the staff was about to write off from the OOB von Tippelskirch’s division instead of von Gärtringen’s. The last named, an enterprising and promising officer from Torgau, got excited in the midst of the fight and went too far supporting Tippelskirch’s attack. He was counterattacked, and we all know too well by now how good Marshal KS-NSD is at coordinating infantry and cavalry in the attack. Without cavalry or a very good position for your guns the only option is to give ground in time. There is small talk within the junior officers and the rank and file in the Corps, wondering why every senior officer is so anxious to support von Tippelskirch when he is so slow when a mate is in trouble. In a day when everyone did a very good job. It must be mentioned the excellent performance that Steve’s cavalry brigade did supporting every division except his own (under orders). A tactical lesson from this battle. The dragoon brigade covering the French left behind the ridge was driven back for some hundred yards by fire from guns and squares, we didn’t dare to use our cavalry. It took some time, but when it was evident that they had lost cohesion and were worn away we advanced our cavalry and they melted away without any melees. I’d say is very likely my CDT was due to right-clicking a flag.